Clearcoat paints were introduced to production cars in the U.S.A. starting in the early 1980's and since that time the technology has continually improved to create automotive paint systems that will last a long time as well as provide a beautiful finish with great gloss, clarity and shine. We now have entire generations of people that have only owned cars with what's called a basecoat/clearcoat paint system; they have never owned, nor worked on a car that has a single stage paint system. 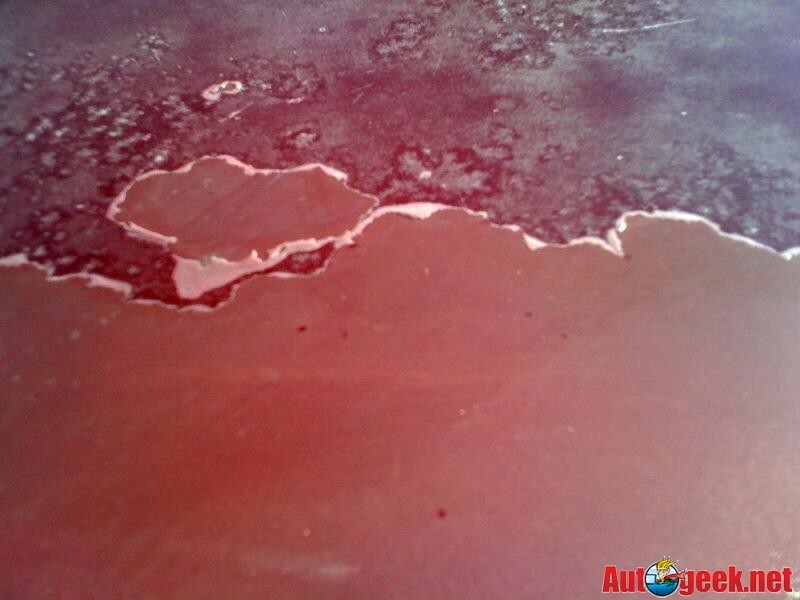 From time to time a new member will join our forum and ask for help removing oxidation from their car's finish not knowing that the problem with their car's paint, (basecoat/clearcoat), is not oxidation, but is in fact clearcoat failure. Clear coat paints, when exposed to too much sun over time and without out proper care, like the paint on a brand new Mustang will deteriorate throughout the entire matrix or thickness of the clear layer of paint. You can't fix it by abrading the surface because the problem isn't just on the surface, it's throughout the entire layer of paint. 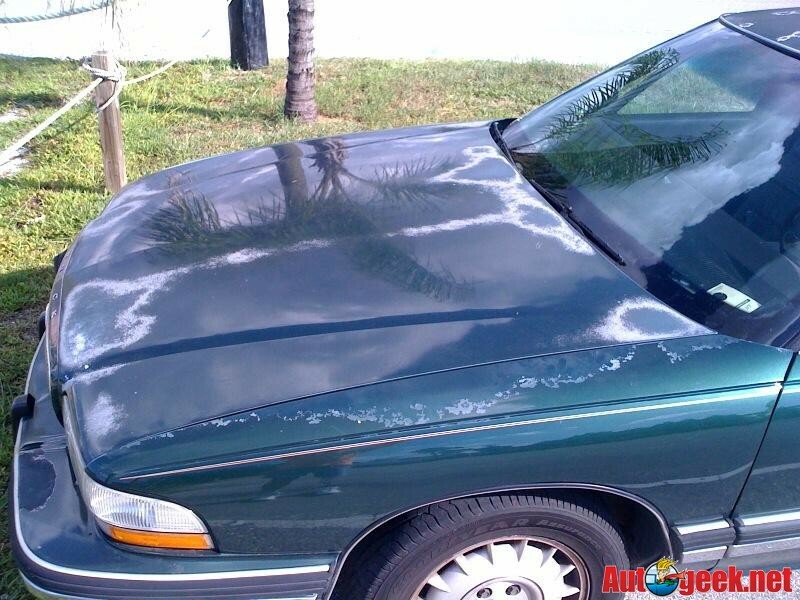 The primary problem most people experience with the clearcoat finish on their car is swirls. Swirls are actually scratches in the paint and they block your view of the color coat under the clear coat. Swirls can be removed because they are topical, that is like oxidation the swirls are in the upper surface of the layer of clear paint and all you have to do is use a compound or a paint cleaner and remove a little paint from off the surface, which will act to level or flatten out the surface again. See the below thread for more information. 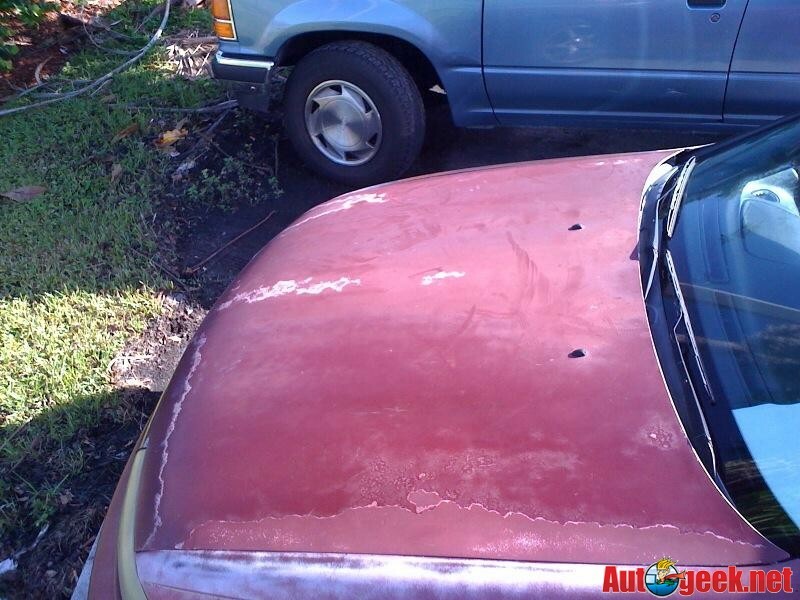 Single stage paints like the type of paint that came on a 1965 Mustang will oxidize and the problem can be fixed because the problem is isolated to just the upper surface of the paint. The way you fix oxidation is to abrade or remove just a little bit of paint off the surface to expose a fresh layer of paint or what we call a fresh base. Top: 1965 Mustang with single stage finish. Bottom: 2009 Mustang with a basecoat/clearcoat finish. Classic cars with oxidized single stage paints are easy to fix, (in my opinion), as well as fun to work on. The thing to understand is that there's a huge difference between these two types of paint systems; the good news is you can usually fix true oxidation but the bad news is in most cases once a clearcoat finish deteriorates to what we call clearcoat failure there's really nothing you can do to permanently fix the problem and restore a nice looking finish that will hold up over time. Usually you have to repaint the affected sections or repaint the entire car, or learn to live with the problem. The basecoat layer of paint under the clearcoat layer is generally dull or flat, even when brand new; it gets it's gloss and clarity from the clear layer of paint on top of it. Once the clear layer flakes or peels off you cannot polish it to make it look good again as it has a flat or matte appearance. 1. Park your car out of the sun as much as you can. 2. Park your car out of inclement weather as much as you can. Snapped this one with my iphone, the clear coat isn't flaking off just yet, just turning white. Looking for a photo of a black car with the hood just barely starting to fail, it would look just a little cloudy or whitish, not a full blown rash. I thought you may want to see a few more photo's for your clearcoat failure archive. These are different than the photo's you show above, but I believe this is probably the beginning of clear coat failure on a car that I am buffing out. You can see the opaque white spots throughout the clear. Mr. Phillips, is there a product you are aware of that can remove clearcoat, but not paint? The failure gets to a point (and I know this) where it would be easier to simply removed all the bad clear (and what's left of the good) and either respray it, or buff and pray. 2000 Lincoln Town Car Cartier, 73,000 Miles, Ivory Parchment Pearlescent Tri-Coat. 1993 GMC Sierra SLE, 134,093 Miles, Hunt Club Red Metallic/Silver. Since I have not been able to find a similar car with the beginning of clear coat failure to photograph for the AG forum, and because this is a very useful picture for helping people diagnose what type of problem they're having with their car's clear coat I've added to the Clearcoat Failure Photo Gallery Archive here on AG but have given proper credit to where I obtained the photograph. Originally Posted by William D.
Not in a way that does no harm to the underlying basecoat which is usually what a person asking your question really wants to hear. It's more complicated than most people think... even if you could get ALL the clear layer off and do NO harm to the underlying basecoat, you would still have to scuff the basecoat and prep it for clear and by the time you start doing this you'll run into problems causing you to just sand it down and re-base it. 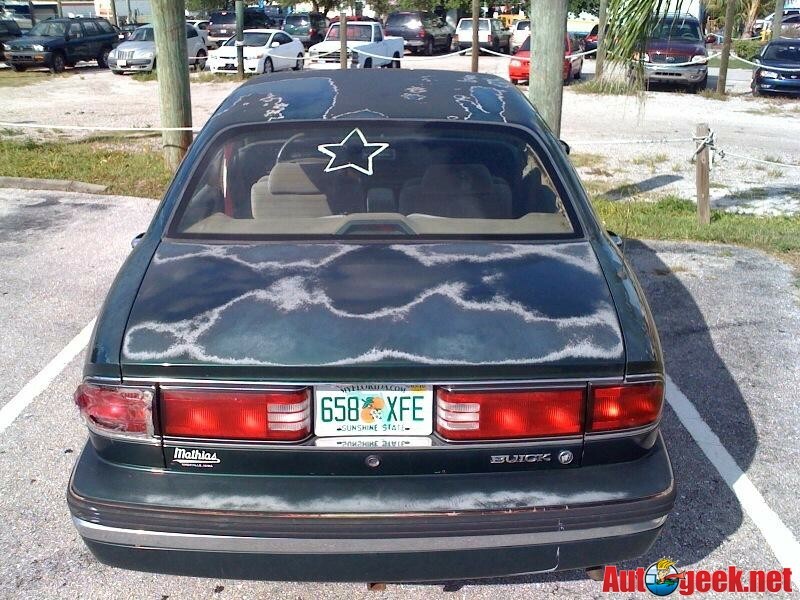 In order to correctly fix the problem you need to either repaint the affected panel or the entire car. No one like to hear the above and that's because so often a good re-paint will coat as much or more than the car is worth. While there might be a problem with the paint in the pictures you've added, that's not what the majority of cars with clear coat failure look like, that looks like some type of prep work, or application problem when the car was painted, or something has affected the paint after it was painted. Or maybe it was done on purpose? I think the sun may be what actually affected it because the dots are only on the top panels of the car. The top of the trunk lid had the dots also, but when I removed the rear spolier to buff the entire trunk, the paint that was underneath the spoiler (protected from the sun) looked perfectly normal with none of those dots. That's why I though it was a type of clear coat failure. 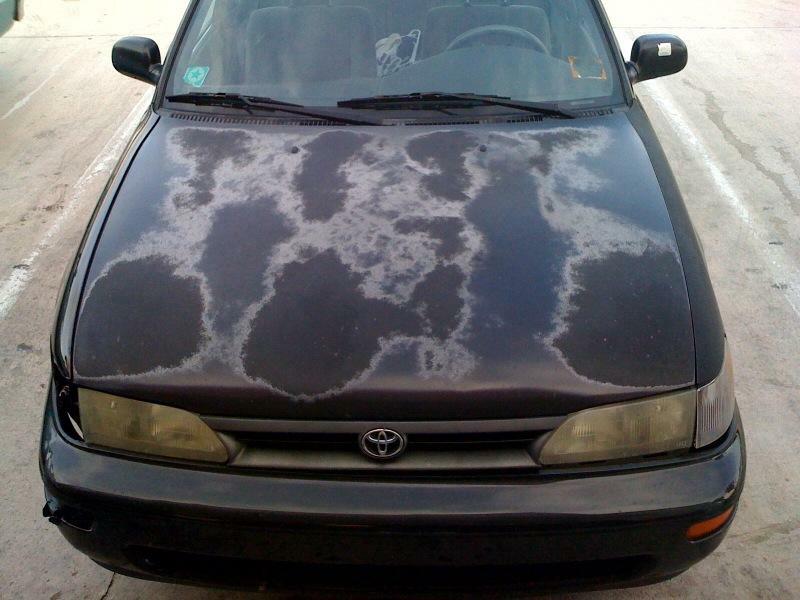 Like you said though, not what the majority of clear coat failure looks like. I think the sun may be what actually affected it because the dots are only on the top panels of the car. If it's the sun, and that's likely, then my first thoughts are that there's a chemical problem during paint application as only "portions" of the paint were affected? The sun shines down equally over the entire panel? Were you able to remove all the spots? If so that means they were merely topical. If buffing had no effect then they are either below the clear coat or throughout the clear layer of paint. No, I was not able to remove any of the spots. I think they were throughout the clear layer. It was smooth as glass when i was done, but they were still there. Here is the entire write up I did on that car with more pictures and description. 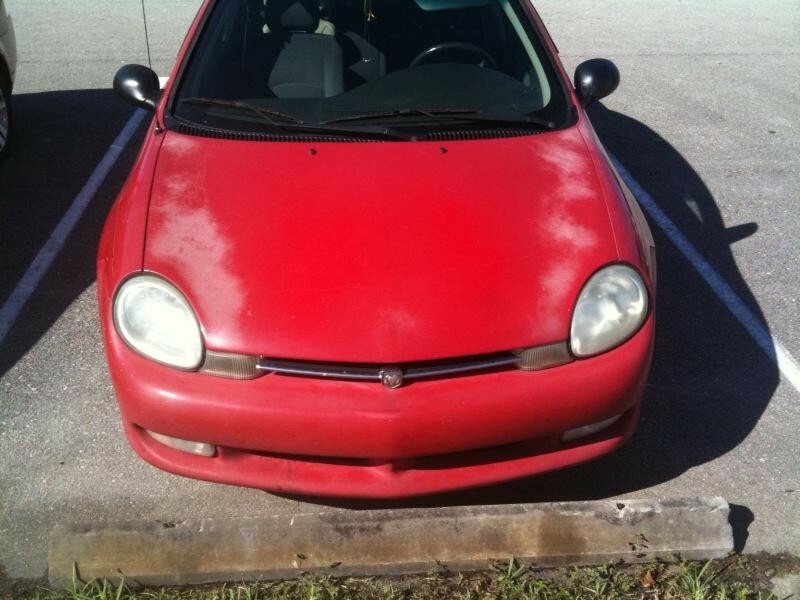 2002 Nissan Sentra Extreme Makeover - [Exterior Only].